Early Thoughts: What do you do with your gift? Yesterday, I was asked to preach at a service at a Uniting Church. Although Initially being asked to preach in April, due to other commitments, it’s been moved back to June, and the day that I’ve been given just happens to be the day of Pentecost. Now, the sermon is a long way off, but I still have some ideas on what I may speak on. To one is given through the Spirit the utterance of wisdom, and to another the utterance of knowledge according to the same Spirit, to another faith by the same Spirit, to another gifts of healing by the one Spirit, to another the working of miracles, to another prophecy, to another the discernment of spirits, to another various kinds of tongues, to another the interpretation of tongues. All these are activated by one and the same Spirit, who allots to each one individually just as the Spirit chooses. For just as the body is one and has many members, and all the members of the body, though many, are one body, so it is with Christ. For in the one Spirit we were all baptized into one body–Jews or Greeks, slaves or free–and we were all made to drink of one Spirit. There are varieties of gifts – but these all come from the same spirit. Varieties of services, but the same lord. Varieties of activities, but the same God who activates them. It doesn’t matter what gift you have, they are all important, and they are all from the Holy Spirit. 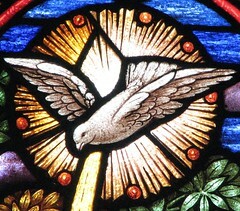 The important thing to take away from the day of Pentecost is that we have been given this glorious gift – the Holy Spirit. Now that we have this gift, what are we going to do with it?